I'm a member of Team Salt. Don't get me wrong - I love me some sweet, too, but salt is what keeps me going through the day. It looks like the people who run Palacio de Sal in Bolivia have somehow gotten wind of my vices and decided to exploit them - by building the world's only salt hotel, on the banks of the world's largest salt flat. 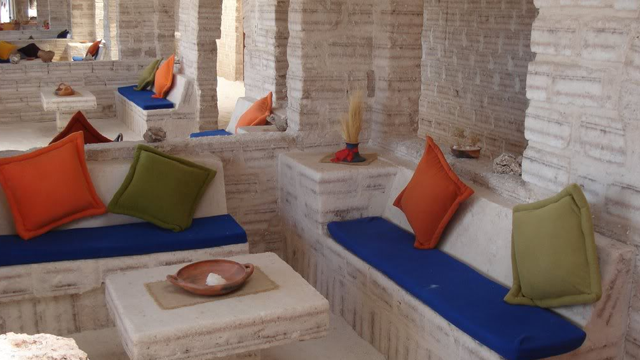 The walls of the hotel are made entirely of salt, as are the ceilings and the furniture. The guest rooms are shaped like igloos, only they're made from salt blocks. I know. Let the licking commence! Actually, there's a strict policy against licking at this hotel, as the point of it is to provide a therapeutic atmosphere, not a delicious one. Which is kind of like saying, "Here's a kettle-cooked potato chip ... now RELAX IN IT." I guess I'll have to settle for the meals prepared by the hotel's dining room, which specializes in dishes made with sugar. Nah, I'm kidding. It's salt.